And with those words from Laurence’s we pulled away from his drive, bikes, kit and team of five all loaded. Five because as well as riders, our team also included Laurence’s son, Thomas, who had volunteered as our team support driver. Or maybe he had been volunteered, either way he was an enthusiastic and welcome addition to the team. Initially it had seemed like a support driver was perhaps non essential, but as our planning took shape it became evident that he could be the difference between us finishing or not. And for even this first part, it meant an extra pair of hands to share the 500km odd drive to Willlowmore. So many things can go wrong in the preparation for a ride – even arriving with a healthy team and a full count of bikes is filled with potential to end an event before it even starts. Laurence’s comment was only half serious, but it highlighted how many moving parts have to work perfectly to get to the end of an event. 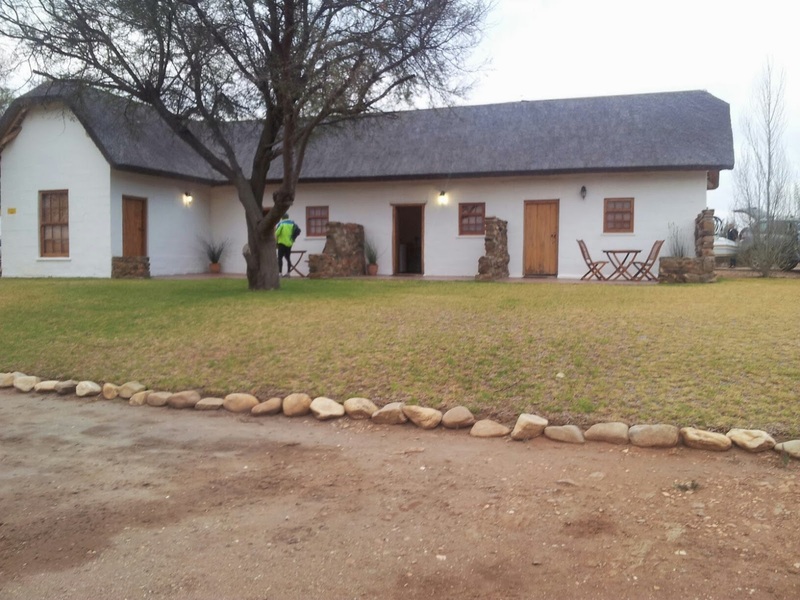 Alarmingly, the B&B I had booked way back in January had closed but the owner Denise, an enormously friendly and helpful lady, had promised she would be re-opening for our team and also for a later booking she had for Karoo 2 Coast. I didn’t doubt her words for one second, but I’d be lying if I claimed it hadn’t caused me some concern initially. A solid farm dinner and comfy bed for the night would be just the tonic required for the night before our big adventure. And as we rolled up the drive it was clear this was exactly what we were going to get. Joley, one of Denise’s neighbours greeted us and left us to get settled in our rooms as she worked on the food. Verberg Herberg Inn may have been technically closed as a B&B, but it was still stunning and immaculately kept. It was also calm and serene, being around 18km away from the main N9 along a surprisingly well kept gravel road. The first stage of preparation was a success – we were all here, the accommodation was perfect, and we had already swung by Willowmore to register, collect our checkpoint boxes, and have an obligatory beer at the Royal Hotel. Dinner was short but pleasant, initially conversation was fairy lively but as the evening wore on pre-ride nerves started to build, at least for me anyhow. I found myself looking inward and mentally preparing for the ride. Laurence made a couple of valiant attempts to convince me to open the bottle of red wine standing on the table. With 3 beers already inside, I knew it was not the safest of ideas, and reluctantly declined. The checkpoint boxes were already packed, but we still managed a quick check and repack as we headed back to our rooms. I knew we’d recheck them again in the morning too, my mind now fully in going-over-ever-last-detail mode. The night was chilly, but the bed was comfy with plenty of warm sheets. I did sleep, but in small bursts of at most a couple of hours at a time. I got out of bed every wake-up, and each time the air and floor were noticeably colder – if tomorrow night (or maybe it was tonight) was going to be the same temperature we’d need every stitch of the warm gear squashed down into the box for checkpoint #4. I probably managed about 4 or 5 hours of proper actual sleep by the time the grey dawn light started peeping through the curtains and I heard showers firing up in the other room and footsteps wandering up and down outside. The endless churning and reworking of our ride had at least highlighted one major mistake on my part. As well as the spare light, I had also stashed all the spare batteries in the box for checkpoint #4. We would be unlikely to actually need these this early in the ride, meaning we would then either have to carry them as extra dead weight, or leave them in the box rendering them unavailable for later in the ride. It could have been a fatal mistake, and as soon as Penny knocked on my door for milk, I dashed around to her room to retrieve the items and put them in my kit bag which we would see with Tom a further 35km down the trail at checkpoint #5. Breakfast done, fresh coffee and soup in the flasks for later, we loaded up and rolled out somewhere around 7:30 – the last short stretch in a car until sometime in the small hours of the morning the next day. Our first mechanical was already waiting to be fixed on the trailer behind. I had lashed one of the bikes down too tight, which had pushed the tyre away from the rim, breaking the seal and causing all air to escape. Luckily it was my bike so I hadn’t messed up someone else’s ride before it started. Even more fortunate was that Laurence knew how to deal with tubeless tyres and after several pumps up to high pressure, bangs, knocks, and bouncy rides up the road, we had the bead reseated and sealed on the rim. I kept the tyre at high pressure though – it would be easier to drop the pressure later assuming the seal held than try and reseat the tyre again with a limited supply of bombs and a handpump. Whilst I was stressing over getting the tyre sorted, the guys were all kitted up, checkpoint boxes handed in, and we were ready to part company with Tom until sometime later that day. My estimate was we’d see him between 8 and 9pm at checkpoint #5, but all being rookies, we really had no idea what lay ahead. Came the well practiced words of Wikus, the ride organiser, as he set us off at bang on 10am. We’d been standing around getting nervous for close on an hour by then so it was good to finally get rolling. 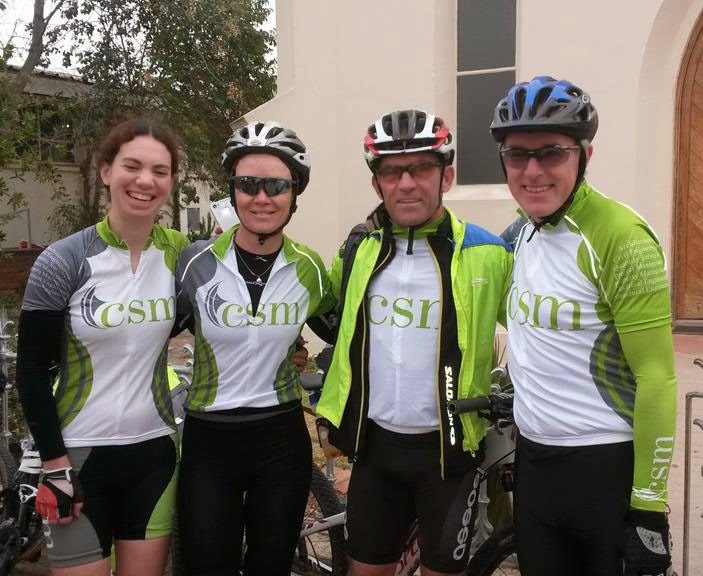 The whole team together, all in great shape, and all looking mighty fine in the CSM team shirts that Vicki had got for us courtesy of her company. I’d mumbled something insignificant by way of an attempted team talk a few minutes earlier, but it was those words from Wikus that really set the scene and resonated in my head as we started off down the main street. Very soon we swung left to swap tar for dirt road. Although I’d ridden far further on a road bike, 230km on dusty, corrugated gravel was going to be a major test. 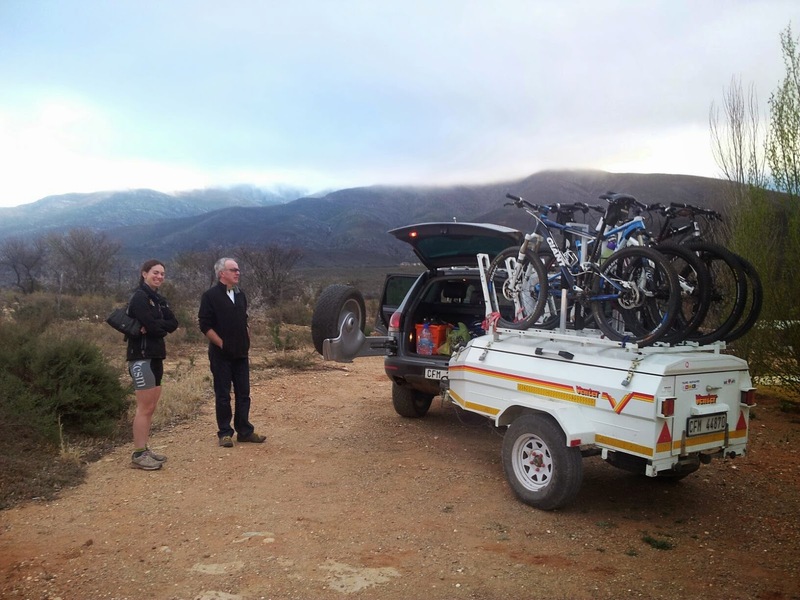 Initially we were all together, but where the trial forked left at the Uniondale turn a pattern emerged that would remain for the opening section of the ride – Penny and I riding a steady pace at the back and Vicki and Laurence were pulling strongly somewhere up ahead. There were times we rode all 4 together, but often we were split in 2 groups of 2. It didn’t trouble me at all, I knew from our training rides we all rode very different paces, and I always expected to be the slower or slowest rider. I also knew that if I went out too hard, I’d be struggling at the end. We regrouped many times though, and finally at 26km in we hit the top of Nuwekloof Pass, marking the end of the gradual climb we had been labouring up since the start. According to the profile, for most of the next 100km, the trail was predominantly downhill. As we started the wonderful descent of the pass, the scenery became more rugged and stunning. High red and orange cliffs rising around us as the trail twisted and looped downward. It was fast, and at times bone-shakingly bumpy. I stopped for a moment to drop the pressure a tad in my tyres, and also switch my suspension into Trail mode, softening it from Climb, more efficient and less bouncy for the uphills but way too harsh for this stretch. Penny, being less experienced on the mountain bike, was rather more nervous on the descent, so I throttled back my speed to make sure she was coming down safely. Eventually the trail flattened out at the bottom of the pass, and we found ourselves pulling into an unpleasantly strong headwind. I was concentrating hard on finding the smoothest line through the gravel, at times it was nothing more than a wheels width of stones flattened by riders in front. The bunches snaked across the road and back, the lead rider picking the easiest line and everyone behind following. Despite the wind the bunches were traveling pretty fast, and I was enjoying myself rather too much. Penny had dropped back, and I realised she probably had a point – we weren’t even 50km into the ride, and this pace was too high to be sustainable. I geared back and Penny and I rode together. Her 26er was also not as optimum for pulling hard and fast over flat terrain as the 27.5 Vicki and I were riding or the 29er Laurence was on. That would even out though as the terrain and road became more lumpy later in the ride. We really should have consulted our distance before taking a short pee stop. Hidden around a corner less than 500m up the track from where we pulled over, were Vicki & Laurence waiting for us to enter the first checkpoint. I had to laugh, they’d waited some minutes longer than needed if we’d only pushed on that short section around the corner. We were all together now though, and quickly topped up bottles, and grabbed some food. I made the immediate decision I was not going to worry about Banting foods for today, and grabbed one of the sandwiches on offer. Keeping my fuel topped up regularly seemed way more important than worrying about avoiding carbs. Straight out of the checkpoint was a climb, not hugely long or especially steep, but definitely enough to test the legs. It seemed a long, hot and dusty 50km from there to checkpoint #2. For the majority of it though we rode together, Vicki had dropped back somewhat, and mentioned to Penny she had hit a bit of a low spot, feeling the early pace. We all backed off and took it steadily. Luckily the profile was mostly downhill. 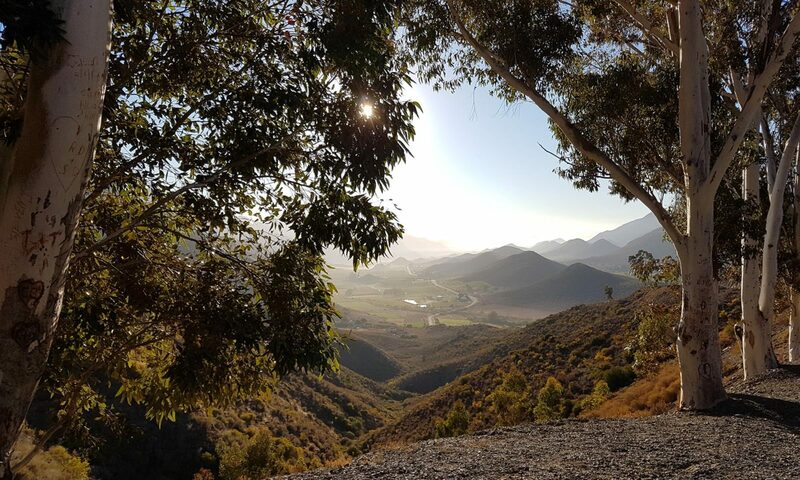 After what seemed like an age, we eventually passed Baviaanskloof police station, and a little beyond it came the gate marking the start of the wilderness section. We’d be in national park from here until Patensie at the other side of the kloof. The gravel road immediately gave way to a much narrower and rougher 4×4 trail, an early warning of the terrain that lay ahead. We splashed through the first couple of river crossings, much shallower than typical for the time of year, still enough to wet the shoes and back though. We also navigated the first section where road and river bed were one and the same. I’d been rather nervous about these stretches – two long ruts of smooth, rounded river bed rocks, some of which were pretty large. The Giant Anthem came into it’s own here though, the larger wheels rolling over them beautifully. I knew this would be the case with momentum, but what surprised me was how stable the ride was even when my speed dropped. Not once did the bike stall out or feel like it would grab a rock or topple – it just ploughed on rolling over every rock and boulder in it’s path. By the time I powered up and out of the river bed, the gritted teeth had given way to a stupidly broad grin across my face – this was fun! I came up to Vicki and Laurence, and with Penny just behind we rode into checkpoint #2 together. Not before time too, we were all starting to run low on water by this stage. Vicki had commented before the ride that checkpoint #2 was a sugar-only stop. She wasn’t wrong – jelly babies, marshmallows, bananas, orange segments, coke. Carbs and sugar were all around. On the way to top up water bottles and backpack, I grabbed a couple of orange segments and a banana, and did also sneak down a couple of jelly babies. Laurence had retrieved our box, and we all topped up jersey pocket with snacks etc. Penny had also stashed a bottle of frozen milk in each box too, as a proper low carber unlike me this was one of her vital fuel sources. I vaguely remember her remarking it was still frozen. Keen to keep moving, Laurence chivvied us along, returning the box and ushering us back to our bikes. Exiting the checkpoint we collected the first sticker for our team token, a round disc of plastic on a lanyard which had to be conveyed to the end of the ride with all stickers attached to validate our passage. It was safely stowed in the top pocket of my Camelbak before we started off again. Soft, deep sand, followed by another stiff climb – seemingly a theme for the location of the checkpoints. I knew the climb was not nearly big enough to be Baviaans Back, but as I puffed to the top I was kind of wishing I was wrong. Sadly I wasn’t, and worse was to come before we did reach the actual climb. In a moment of silliness I pushed too hard in too big a gear on the smallest of ramps a little way down the trail and a sharp cramp shot through my left quad. A couple of kilometers further on the trail turned upwards for the climb proper, and my right quad was tightening in sympathy. This was not good – barely half way into the ride, and with all the big hills still ahead. On any normal ride, my spirits would have sunk at this point. Except this was no normal ride – it was a team ride, and Vicki was there just behind me. It was a great relief. She was more than capable of powering up the climb, but sensing my physical and mental distress, she had sat back and chaperoned me the whole way to the top. Somehow, despite the tightness, neither leg seized fully – the slope was just shallow enough to be able to stay in a low gear and keep spinning lightly. I even passed a couple of 26ers on the last stretch to the top where Penny and Laurence were waiting. It was a worry though, MAC (Mother of All Climbs) lay ahead, which even without crampy legs would have been a test. For now though, we had a lovely fast descent down towards checkpoint #3. We hadn’t seen much wildlife so far, although buffalo spoor was evident along the trail. Towards the bottom of the run down though a female kudu flashed across the trail. She was several meters ahead of Vicki, but at the speed we were descending, it was literally a couple of seconds from colliding with her. Gradually the light was fading, and shadows lengthening. Drifting smoke and the smell of braai meat announced our entry to checkpoint #3. Just in time to fit the lights we’d need for the rest of the ride. We each collected coffee, sosaties, potatoes and other snacks, Laurence was rather miffed that he’d been flatly refused a second sosatie due to rationing for all the riders, whereas Vicki had managed to grab two without complaint. It took us some time to get all the lights and batteries mounted. Laurence’s back light was rather patchy, so I attached my spare to the loops on his backpack. Exiting the checkpoint gave us our next sticker, and something of a surprise. One of the volunteers was pouring shots of Witblits. It was harsh, firey, and a great kick to the pants to get the next leg of the ride going. We needed that shooter almost immediately. Ahead was my biggest fear going into the ride – another stretch of river boulders, but this time the riding surface was invisible under about half a meter of water. To make matters even more interesting, Laurence stood ready to take pictures of us as we rode down into the water. Nerved by the water, Penny almost immediately splashed a foot down. The temperature was starting to drop, and wet feet were the last thing I wanted. 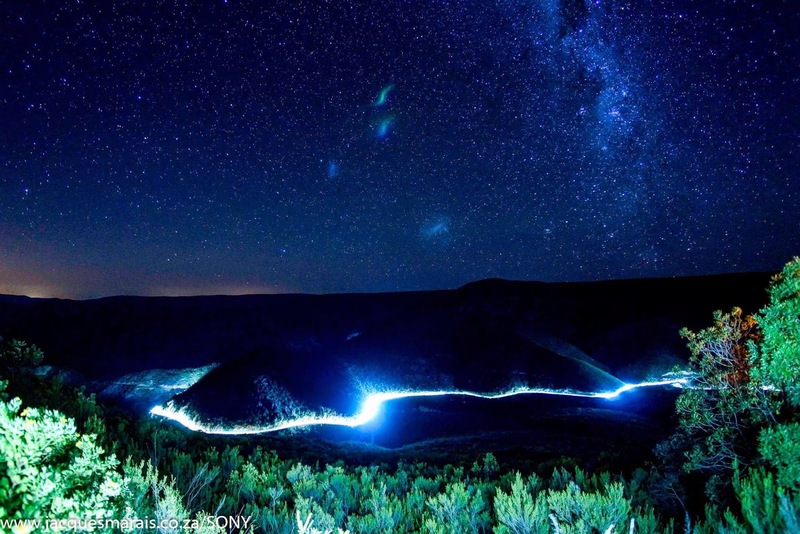 It was a long stretch as well – too long to just charge through and power out the other side. With no way of knowing whether you were heading for a big rock or a deep hole under the water there was nothing to do but hold your nerve and ride steadily through, hoping you had a good line. A couple of times my front wheel stuttered into, over or around some hidden obstruction, but somehow the bike just kept going until eventually we hopped over a short concrete lip, up and out of the other side of the river. Any idea of dry feet was gone though, the water was deep enough that my shoes were just as soaked as Penny’s. No sooner than we’d negotiated the water torture than we were onto the first of the Fangs – two short sharp climbs softening us up before the biggest hill of the day. I think I managed to ride the first of them, but part way up the second a short steep section with a sketchy surface was too much for the still crampy legs. Where normally I’d just have powered up to get over rougher terrain, the tightness in my quads simply did not make this a viable option. By the top of the second Fang the light was almost gone – riders all around were firing up lights, and we lit ours up too as the team gathered at the top. I knew Penny would be nervous descending in the dark, and so we all hung back a bit to give a better view of the trail from our combined lights. The last rays of daylight had gone and it was fully dark as we started the Mother of All Climbs. All that we could see was a twisting ribbon of lights winding up and over themselves and seemingly right up into the stars. It was a simply stunning sight, and at the same time a rather daunting one. We still had to get up there! Initially both Penny and I were going well, but as the gradient pitched up and surface deteriorated we both dismounted more and more often, until eventually we were just walking. I wasn’t surprised, or even unhappy really. My legs just did not have enough to spin up this section, but I was worried about how much time it would take us walking. This was a long long climb. Penny did point out that we weren’t actually that much slower than our pedalling speed had been though, which made me feel better. We met up with Laurence and Vicki at one point, both of whom had managed to ride to that stage and had waited some time for us. The view was even more stunning from here – a wiggling line of white lights coming up the hill behind, and a matching line of red tail lights rising up ahead the other. Laurence rode on but I seem to recall Vicki stayed walking with us for a while. Eventually we swung right past a parking spot, and the gradient eased. I took a rare glance at the distance screen on my Garmin. It was clear the checkpoint was still a couple of kilometers ahead. There was simply no point walking this section, so we all mounted and ground up the easier and flatter final part of the climb. Ahead was an initially confusing sight – a line of riders both coming and going along a path to the left. It was the panhandle turn into checkpoint #4. Laurence was grinning at the end of the short grassy track – clearly pleased with himself at managing to cycle the whole of the climb. I’d have loved to had the legs to do the same, but at that point in time only two thoughts were going through my head: MAC was behind us; and the legendary Bergplaas soup was waiting for us inside the checkpoint. It wasn’t just the soup that was warm and welcoming. Our chief whip Laurence had suddenly mellowed, and everyone sounded very relieved to be able to linger and faff for a little while. Whilst we sat and sipped soup and coffee, two cups of each in my case, we also raided our final checkpoint box for the warm clothing we’d packed the night before. It was perfect timing, the sweat from the climb was already starting to become cold and clammy in the suddenly quite chilly night air. I even managed a quick call home, this being the one spot in the kloof to have a cell phone signal. In fact, I caught Henri first, Yoli’s brother – the whole family were gathered for a braai. By the time Yoli herself came to the phone she was in a bit of a panic. I had forgotten I’d said there would be no cellphone signal and would only be ringing if I’d pulled out of the ride. Oops! Once the panic subsided, Yoli was very happy to hear about our great progress and what a stunning ride we were enjoying. A quick chat and goodnight with Ben was the perfect last tonic to get me up on my feet again and starting to kit up ready to ride. Laurence had also taken the chance to call Thomas and update him on our progress. It was already somewhere after 9pm, and there was still 35km to go until checkpoint #5. My estimate had been hopeless. I felt rather bad – Tom was going to be in for a long night supporting us. I’d made a potentially disastrous mistake. The mount for my spare front light was still empty – and Vicki had already returned our checkpoint box. What an idiot. Desperate to correct my mistake, I raced back through the crowds at the checkpoint and just managed to recover box #59 as it was being stowed back on the truck. I grabbed it, got the cable tie snipped, whipped out the light and batteries, and dashed back to get the box back on the truck. An immense sense of relief came over me as I got back to the bike, and we mounted up and rode out. At this stage I had no idea just how lucky I was managing to get our box back and retrieve the light. Trans Baviaans had taken on something of a mythical status in my mind over the years since I’d first heard about it, the ride so far had already lived up too and exceeded every expectation I’d had of it. What was to to come next though totally blew me away. I knew the descent from MAC was steep, rough and twisty over the opening kilometers. It hadn’t occurred to me though what a stunning view this would yield. The dark outline of the mountain was barely visible ahead, and the myriad stars of the Milky Way shimmered in the night sky above. In a weird sense of symmetry, hundreds of tiny lights were picking out the trail beneath diving around successive switchbacks. In a split second, we became part of that chain of earthbound stars. The track was rough, and potholed, and required a lot of concentration to spot riding lines over, through and down the ruts and rocky drops. It was an absolute blast – letting off the brakes and flying down the track, pulling a short sharp blast on the levers to wash off some speed ahead of the next bend, sighting a line through the bend, backing off the brakes, and feeling the bike surge smoothly around the small berms through the corner. I joked to Laurence not to touch his brake discs for fear of melting his gloves. I’m sure with the speeds we were carrying and the sharp bursts of braking they would be riding pretty hot by now. I’d forgotten myself though, or rather my team. This was in places a tricky technical descent, and Penny had never ridden off road in the dark. I dropped back and as she caught up took up a somewhat slower pace so that she could follow my line and lights down the rest of the hill. It was over too soon. Even with my crampy legs, if we’d had the chance I’d have gone straight back up again for one more turn down the fairy-light roller coaster. Everyone had talked about how stiff a climb MAC is, but no one had mentioned what an absolute ripper it was to fly down. 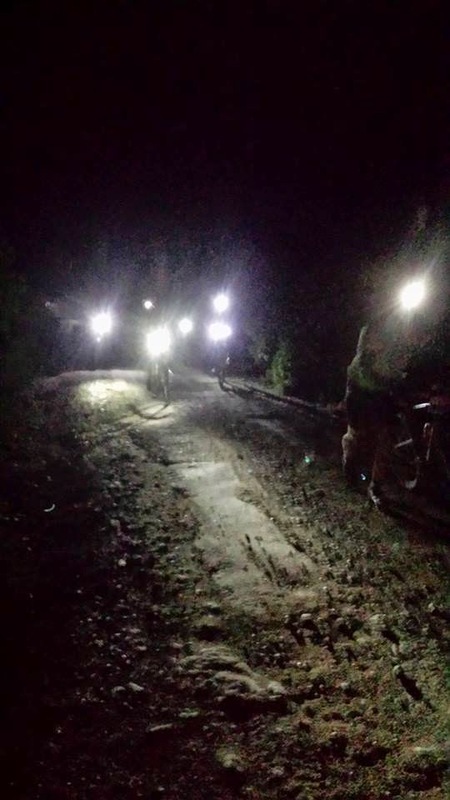 Something I discovered on LEL was that I absolutely love night riding – I often have my best sections in the dark hours. Maybe it was just this, or maybe it was the magic soup at the last checkpoint – but as the trail leveled at the bottom of MAC my energy levels and spirits rose. My leg muscles may have had some residual tightness in them, but this was now my sort of riding – short rolling ramps, and long stretches of fast and steady cadence riding. The pedaling felt effortless and we were motoring at last. For the first time also I was absolutely comfortable with our pace. It may have been fast, but with the experience of all those Audax miles, I knew what sustainable felt like. Our pace picked up even more was we hit smooth tar for the last kilometer or so to the next checkpoint. I forget if Vicki’s or Laurence’s battery pack had started failing first, but by the time we pulled into checkpoint #5 both were running out.. Not only was Tom there wide awake and waiting for us, but his support immediately became essential at keeping our ride on track as we retrieved the spare battery pack from the trailer for one of the guys. Donating the battery pack from my light completed our set again, with me switching to the spare light we had so narrowly managed to recover from our crate at the previous checkpoint. As a precaution I also grabbed all of the extra batteries for my spare light – with a limited life of around a couple of hours, several might be needed. As we sorted ourselves out Tom told us a bit about his journey. We had ridden 175km to this spot, but the support drivers route had taken Tom around 500km to get to the same spot. Even with a detour into Jeffrey’s Bay it was a startling difference in distance. His commitment to our support was such that there wasn’t a hint of complaint in his tone describing the massive roundabout tour to reach us. As we chatted I sloshed back two more cups of coffee and stuffed down a white roll filled with chips. Definitely nothing low carb about my ride fueling plan now, but I didn’t care. I was over my slight slump from earlier, and was loving the riding. The checkpoint was bright and buzzing and in one corner a solo guitarist was belting out live music to complete the party atmosphere. It would have been all too easy to linger until the 3am closing time for the control and just enjoy the festivities. Our ride was far from done though, ahead lay 65km more riding including a substantially lumpy section known as the Never Ending Climb which would start almost as soon as we left the checkpoint. According to the route profile, it looked like we would be climbing for a significant part of the next 30km. It was time to get started, and we rolled back out into the night, collecting the next sticker for our team token on the way. Never Ending Climb was not inaccurately named. There were a couple of short flat or downhill sections, but mostly it was just a very long steady grind. At least my prediction that it couldn’t possibly be that steep with it being so long proved to be largely accurate – aside from a few very short sections, the gradient was kind and it was easy to keep a nice light spinning cadence. My quads were extremely thankful of this. Somewhere en route to seeing Tom at checkpoint #7 there was something referred to as the unmanned checkpoint #6. I knew we were nearing it, and seeing a large orange red glow on the hillside to our left I mentioned to the team that maybe the checkpoint was up ahead. In between bouts of hysterical laughter, the guys pointed out to me that what I was looking at was in fact the pale glow of the moon rising up above the mountain side ahead. Oops! My distant vision with contact lenses is never brilliant, but even with trail dust and tired eyes it was a pretty epic mistake to make. When we did eventually reach checkpoint #6 it was rather disappointing. A simple table planted at the side of the track, with an empty plastic container screwed to the top. There was no sign of the stickers which should have been inside for our team token. Clearly someone had miscounted, or stolen them. It was rather pointless really. The stop did give us a chance to look at Laurence’s light though – the bolt holding the mount had sheared off. Digging down into my Camelpak we managed to find enough cable ties to make a temporary fix. The war of attrition on our front lights was not letting up – we were two battery packs down, and now a broken lamp. It took me a few minutes to figure out what we could do by way of a longer term fix. Then it came to me. I’d tossed my main light back into the trailer when it became redundant as we swapped battery packs around at the last checkpoint. We’d be seeing Tom again a short way down the trail. We could retrieve it again, and swap out Laurence’s broken front light. Somehow we’d skate through another front light issue thanks to the stalwart presence of our backup driver down the road. I chirped at some stage as we freewheeled rapidly towards checkpoint #7. We were now well into the small hours of Sunday morning, and I was really starting to feel strong. I’m not sure if my exuberance and irrepressible chattiness was starting to get on the nerves of my team mates, but they were too polite to say anything. Instead they answered back that it was a first for all of them – Laurence went further that it was a day of firsts; longest time on a mountain bike; longest ride of any kind; and first ride spanning two days. He may have listed a couple more which I’ve forgotten. It seemed I wasn’t the only one in good spirits. 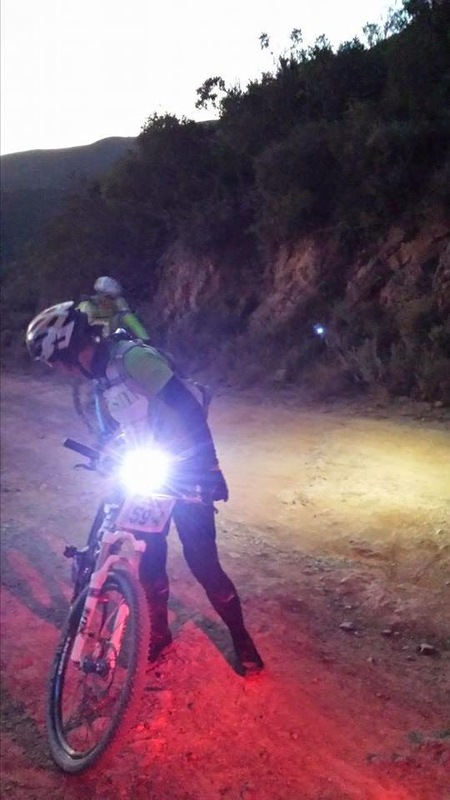 Very soon the the slight glow of the lights of Jeffrey’s Bay were visible as we rolled left into checkpoint #7. A little later on as we sat on hay bales eating delicious Jaffels, Tom was able to explain the strange alien red lights we’d been seeing to our right on the run down to the checkpoint. They were lights on the massive propeller blades of a huge wind farm on the hills around the town. We sat for a few minutes and savoured this last checkpoint. It was a small affair by contrast to checkpoint #5 had been back near Patensie. In place of the party spirit though, a tremendous warmth and spirit seemed to enshroud everyone there, riders and volunteers. None of us were quite sure exactly how far it was to the finish – estimates ranged from between 20 and 30km. But the fact remained, we were within striking distance of the end now. A couple more hours on the bike and, barring mechanicals, we would have completed the legend – our team would have ridden Trans Baviaans. Laurence’s words stirred us, and we kitted up and rolled down the grassy field into the darkness again. The path swung left and wound past some posts with automated flash cameras on them. Just around the corner the reason for this route out of the checkpoint became clear, it took us onto a farm track through a tunnel under the highway. The ride organisers had done an amazing job keeping us off tar and on trails, even on these approaches into Jeffrey’s Bay itself. For several kilometers we rode along, down and around a succession of farm tracks. Bizarrely it seemed for quite a while that not only were we not actually getting closer to Jeffrey’s Bay, but we also seemed to be continuously riding along the same wind farm. I’m not sure if it was a trick of the mind from so long on the bike, or just that it was one humungous wind farm, but we did eventually leave it behind us. Not before one last evil climb though, the aptly named mini-MAC – steep, rough, but thankfully short. I took a run at the opening stage, and flashed past quite a few riders as I did, but I didn’t quite have the legs to keep the momentum going and walked the last section. Sure enough, there was Laurence grinning again at the top. None of the climbs had beaten him, and this was most definitely the last one. It wasn’t the last test though. In one last effort to keep us off tar road, the planners threw us onto 10km of single track following the railway line into the town. I swapped out my front light battery for a fresh one and waited for Penny. I knew her battery pack could not have much life left in it, and the single track would not be here favourite section even in daylight. She rode in front of me the last couple of kilometers. I had to smile too. Despite doubting her abilities on technical sections, she was going well and it was one of the guys in front of her who actually fell off, swearing as he went down. Whereas Penny came through strongly and unscathed. Her light held out just long enough to see us back over the railway line, and onto smooth tar road for the final run home. A welcoming confirmation from the marshal signalling our route into Fountains Mall. Across a short patch of grass, down a kerb, one left, one right through the car park, and there was the big red arch marking the finish. We adjusted our pace to match each other, lined up four abreast, and crossed the line together. The time was somewhere past 3:30am. We hadn’t broken any records, and we were way over the time we’d contemplated when planning the event. We were also clearly at the tail of the finishers (someone mentioned to Vicki there were still 170 riders out behind us). None of that mattered one jot though. We’d had no punctures, no mechanicals that we couldn’t fix, no accidents or injuries, and to cap it all off the weather had been sublime the whole way. The ride could not have gone better. Everyone was smiling as the photographer snapped our picture. The smiles were still there as we sat on the kerb munching on Spur burgers and fries and reminiscing over the ride. I took a quick glance at the medal as we were sitting there waiting for Tom. It was just another medal, no bigger or more striking than any other on my shelf – but it was special all the same. This was a bucket list ride medal, setting it apart from most of the others, aside from perhaps DC and LEL. After a short delay rousing him from a well earned nap, Tom arrived to haul our tired bodies back to the apartment which he had already checked us into and dropped our gear at. Sadly the celebration would have to wait though – for two reasons in fact. Firstly was that my coolbag contained a now toxic explosion of burst beer bottles, leaking thawed out curry, and broken cool brick gel. The smell was overpowering and I quickly gave up trying to salvage any of it. The champagne had survived, but was warm. Before we had time to even contemplate whether we drank it anyway though, the lights went out. We had no torches or candles, and there was no one around to get any from. Clearly we were not meant to be partying tonight. We each showered off the caked on trail grime to the dim glow of our cellphones and crashed in our rooms. That wind farm may have been massive, but clearly it wasn’t quite big enough. We did get to celebrate though, later on Sunday when we arrived back at Laurence’s house. I needed a lift from Yoli to get me and the bike home anyway, so I convinced her to bring Ben over so we could at least crack the Champagne Laurence’s wife Chris also joined us, and there we sat, gathered around with drinks in hand and chatting about the ride and sharing the highlights. I’d imagined many things about Trans Baviaans over the years, and the ride had lived up to all of them. The aspect I had never considered though was that in every respect it was a team ride – everyone looking out for each other. Sitting there on Laurence’s balcony in the cool evening air, it struck me how much greater the event had been because of that. An amazing adventure shared with a superb group of friends.